Master Sanchez was born in Bronx, New York, on September 30, 1969. His parents, Carmen Moya and Miguel Sanchez, are naturally from Puerto Rico. Miguel Sanchez, his father, served in the USA Army. In 1977, Master Sanchez moved to the big city of San Juan, Puerto Rico. In 1979, he started training in the Martial Arts. His first style, Karate Kyokushin, was one of the strongest styles of Karate. Kyokushin was founded by Mas Oyama, and taught to Sanchez by Master Adrian Becerril, Grand master Vincente Guzman and Grand Master Kenny Morales. Sanchez has also trained in Karate, Jujitsu, Tae Kwon Do, Hapkido, and kick boxing. In the early 80’s he started training with Tae Kwon Do in New York, with William Martinez. Sanchez returned to Puerto Rico and trained with Jose Santos and his real Master, Luis F. Rivera. Rivera has a Master’s Degree in Hapkido. He also was one of the original people who brought TKD Chung Do Kwan to Puerto Rico. From 1980 to 2001 Sanchez competed in over 350 full contact and open tournaments. 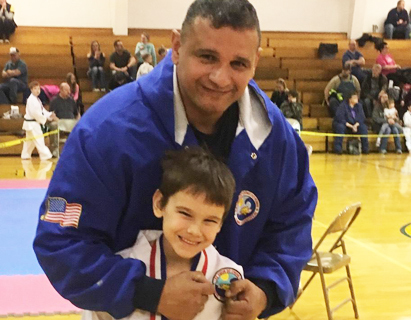 Sanchez competed in Karate, Tae Kwon Do, and amateur kickboxing. He has competed in New York, Indianapolis, Michigan, Florida, Mexico, Canada, the Dominican Republic, and areas of South America. Sanchez was the champion in 1993-1996 for full contact Karate in Puerto Rico’s open tournament in Nippon-Kempo. In 1997 Sanchez was the head coach of the Puerto Rico team that competed in the world Chung Do Kwan tournament in Washington D.C. Sanchez moved to South Dakota in 1998. He has since started a club in Clark, SD. In 2000; Sanchez went to South Korea for testing and earned his 5th degree in Tae Kwon Do. Later that year, he went to New Jersey to for testing and earned his 4th degree in Hapkido with Grand Master Ik Hwan Kim. In 2001, Sanchez founded T.C.C.A. (Tae Kwon Do, Chung Do Kwan, Combat Association). T.C.C.A. was endorsed greatly by Great Grand Master Hae Man Park. Sanchez represents the Latin-American Chung Do Kwan Association, run by the President Grand Master Oscar Tajes, from Argentina. Today, Master Sanchez’s schools have reached students throughout the region, with schools in Pipestone Minnesota, Brookings, Colman, Willow Lake, Miller, Redfield and Clark South Dakota, as well as schools in Puerto Rico, The Dominican Republic and Panama.